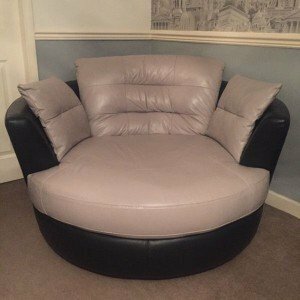 A Large circular low back swivel love seat, upholstered in black leather to the base and grey leather to the seat. 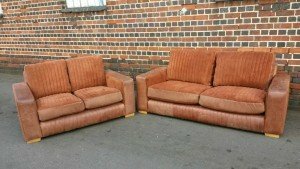 A large two seater high back Thomas Lloyd sofa, together with a matching smaller sofa, upholstered in tan suede. 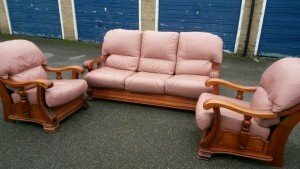 A three piece vintage sofa suite, includes a three seater high back sofa and two matching armchairs on a solid wood base. 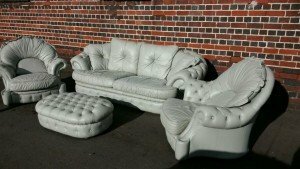 A four piece Pendragon sofa suite, includes a large two seater sofa, two armchairs and a storage footstool, upholstered in grey leather with button detailing. 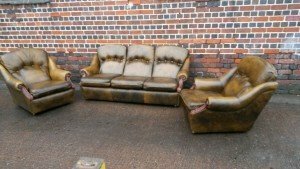 A three piece vintage Chesterfield sofa suite, includes a three seater high back sofa and two matching armchairs. 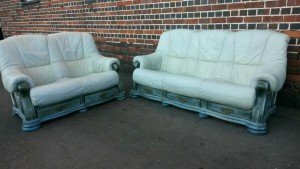 A large three seater high back sofa and matching two seater sofa, on solid wood hand painted bases, upholstered in white leather. 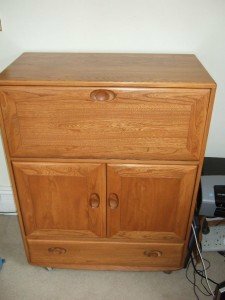 A three piece bedroom furniture suite, includes a solid wood double wardrobe, a chest of four drawers and a three drawer bedside unit. 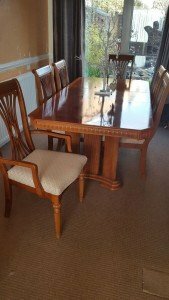 A solid wood extendable dining table, together with six matching dining chairs, upholstered in cream satin. 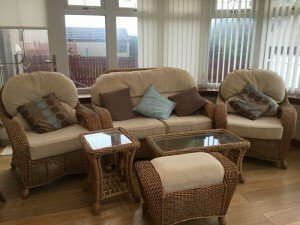 A six piece wicker conservatory furniture suite, includes a two seater sofa, two armchairs, two glass inlaid tables and a footstool. 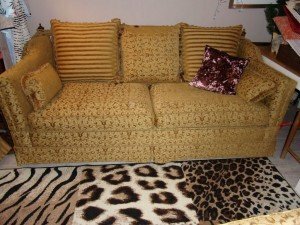 A two seater low back vintage sofa, upholstered in gold patterned velour, together with a animal fur patchwork area rug. 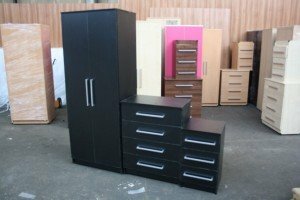 A three piece bedroom furniture set, includes a black double wardrobe, a chest of four drawers and a three drawer bedside unit. 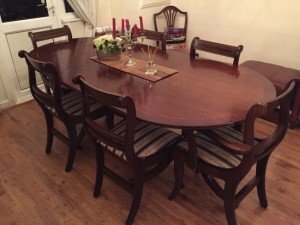 A mahogany oval extendable dining table, together with six matching low back dining chairs. 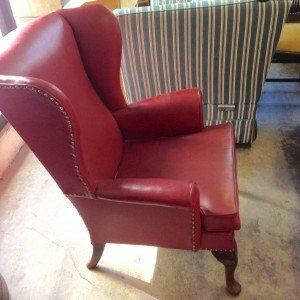 A vintage high back gentleman’s armchair on mahogany legs, upholstered in red leather with brass studded detailing. 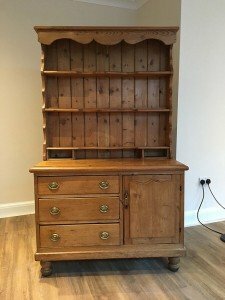 A tall standing vintage pine kitchen dresser on ball feet, having three shelves above two pigeon holes, three brass handles drawers aside a small cupboard. 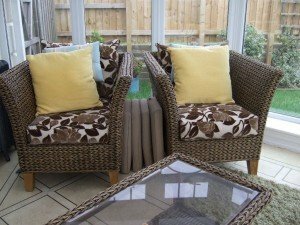 A three piece rattan conservatory suite, includes two armchairs upholstered in brown floral patterned fabric and a glass topped coffee table. 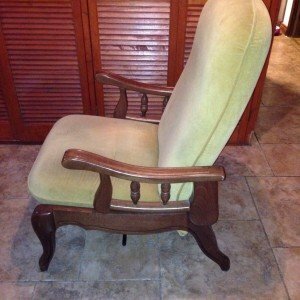 A vintage high back gentleman’s armchair on a solid wood base, upholstered to the seat and backrest in light green velour. 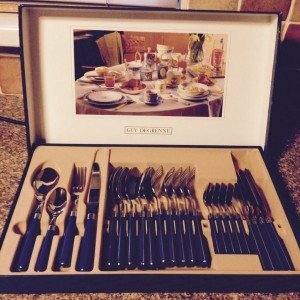 A new boxed Guy Degrenne twenty four piece midnight blue cutlery set, includes five forks, five knives, five tables spoons, five desert spoons and four teaspoons. 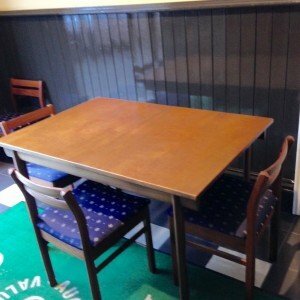 A vintage teak dining table, together with four matching low back dining chairs, upholstered in midnight blue fabric. 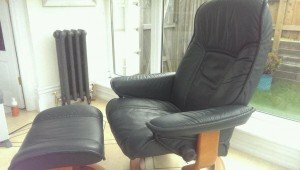 A vintage high back gentleman’s swivel chair and footstool, upholstered in black leather, on castors. 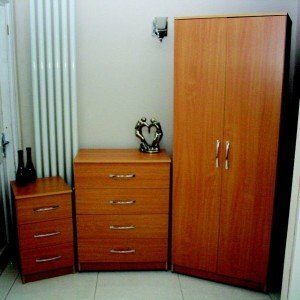 A vintage solid wood dresser on brass castors, having a pull down shelf above a double cupboard and a single drawer.